Woodlands Stop Over & Lodge - Francistown Accommodation. WOODLANDS STOP OVER AND LODGE'S tranquil, out of the noisy city, location makes it an ideal destination for a few days or a quick stop over en-route to the Okavango Swamps, Chobe Game Reserve, Central Kalahari, Makgadigadi Pans, Botswana National Parks, Victoria Falls & other northern Zimbabwe destinations. Situated on the beautiful banks of the Tati River about 10km north of Francistown off A3 Nata/Maun Road. We are sited on the OLD HUNTERS' ROAD. An historic route travelled by hunters, explorers and missionaries of yesteryear. Plan to stay with us a few days & let us organise day trips to various interesting spots in & around this area, or just stop to break the long journey for those exploring the northern territory of Botswana, returning home and for those wanting to be safely off the roads before dark. Francistown International Airport is 10Kms from us and transfers can be arranged on special request. We are a self-catering establishment. WiFi is available to all resident guests. Woodlands cottage (1) is our premier accommodation sleeping four in two separate en-suite rooms. It has all the facilities of a tastefully furnished home. 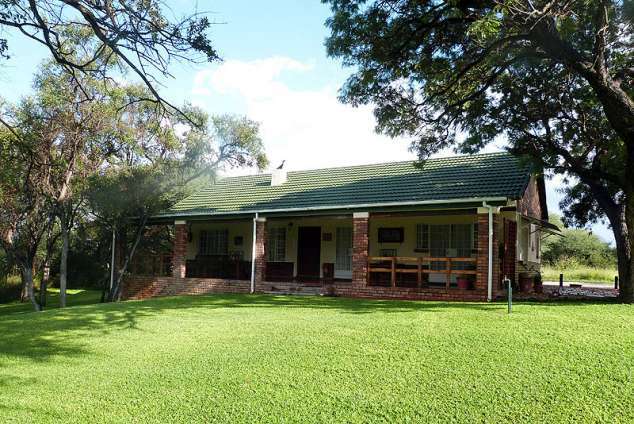 A beautiful private veranda & secluded braai area on the front lawn overlooking the river. Fully equipped for self-catering with a kitchen area suitable for catering. There is access for guests to use the sparkling swimming pool at the campsite. Delicious homemade pre-prepared meals, braai packs, wood, ice & drinks as well as basic provisions are available. There are a few good restaurants in the city which could be recommended to guests using the facility. Two walk & birding trails on the property and the bird life is an ornithologist's paradise. Dinkie Dam sports Tilapia fish for the ardent fisherman and novice alike. Woodlands Lodge is more than a Stop Over & we encourage you to stay a few days to really appreciate the ambiance of peace & tranquility and watch the abundant bird life for which we are also well known. Travelling from South Africa (north) on the A1. When approaching Francistown, at the second traffic circle, turn left onto the A3-Nata/Kasane road. After traveling 10km from Francistown look out for the “Woodlands Kingfisher” sign on the right hand side of the road (this sign board is exactly 2km after the Orapa Road turnoff). Turn right. Once you are off the main road you will travel on a 7km, passable, dirt road (also fit for non 4WD vehicles) leading to the campsite which is well sign posted. You will be welcomed by our friendly staff at reception. Travelling from Zimbabwe on the A1. When approaching Francistown, at the second large traffic light intersection, turn right. Travel along this road going over the railway line and through three sets of traffic lights until the T-Junction. Turn right onto the A3-Nata/Kasane road. After traveling about 8km from Francistown look out for the “Woodlands Kingfisher” sign on the right hand side of the road (this sign board is exactly 2km after the Orapa Road turnoff). Turn right. Travelling from Nata/Kasane (south) on the A3. When travelling south on the A3 from Nata/Kasane, the “Woodlands Kingfisher” sign board is clearly visible on the left hand side of the road about 190km south of Nata (8km after you have passed the sign board stating 20km to Francistown). Turn left. Detail description : Birding paradise! Beautiful bush and riverine walking trail. Tranquil setting near town. 1461 page views since 18 Feb, 2015. Last updated on 17 Apr, 2018.